EAGLE SCOUTS from the Class of 2017 at their Eagle Court of Honor in St. James’ Church on Dec. 17. From left to right are Ryoma Urasaki, Montgomery Greene, Simon Lee and Andrew Jeon. Boy Scouts Troop 10 is the oldest continuously sponsored troop in the nation. Founded in 1914, the St. James’ Episcopal Church chartered organization is celebrating its 103rd year, said scoutmaster Matt Rauchberg. Its 50 members come from a variety of schools and neighborhoods including Hancock Park, Larchmont Village, Windsor Square, Fremont Place and Koreatown. Schools include St. James’, St. Brendan, Loyola, Los Angeles Center for Enriched Studies, Harvard-Westlake, Los Angeles High and others. Troop 10 is partnered with Cub Scouts Pack 10 of St. James’ Church and Pack 16 of St. Brendan Church. They each run separately and have their own Cubmasters. By tradition Troop 10 is partnered with or affiliated with both Packs and each year the Webelos (5th graders) from each Pack celebrate a “bridging ceremony” where they “cross over” from the Cub Scouts to the Boy Scouts and become new members of Troop 10. IN SEQUOIA, left to right, are Spencer Isbell, Max Rauchberg, Jerald Shin, Alex Rice and Luke Gil. “We typically conduct nine to 10 overnight campouts per year, seven to 10 local hikes (including clean-up events with former Councilman Tom LaBonge in Griffith Park), and one to two summer camps,” said Rauchberg. Recently the Troop has been asked to “adopt” the Griffith Park Bird Sanctuary (still recovering from the 2007 fire) and conduct a series of restoration and beautification projects. Last summer, the Troop attended Camp Cherry Valley on Catalina Island for the 34th consecutive year. 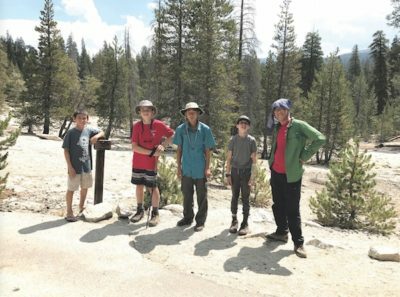 “In addition to our monthly weekend camp-outs and our summer camp on Catalina, this summer Troop 10 took a three-night, 20-mile backpacking trip through the Jennie Lakes Wilderness in the Sequoia National Forest near Sequoia National Park,” said Rauchberg, in his third year as Scoutmaster. Darleen Stoker is the Troop Committee Chair. In its long history, Troop 10 has had thousands of Scouts, including more than 300 Eagle Scouts. Many Troop 10 Scouts have gone on to become prominent civic leaders, including heads of major banks and other corporate institutions. “Troop 10 is extremely proud of this year’s four Eagle Scouts,” said Rauchberg. 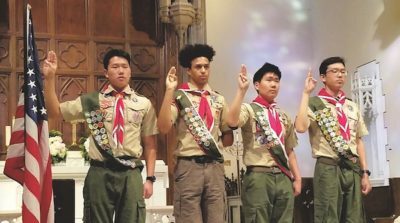 The 2017 Eagle Scouts are Ryoma Urasaki, Montgomery Greene, Simon Lee and Andrew Jeon. “To achieve the Eagle rank, the highest honor in Scouting, takes years of hard work and dedication,” according to Rauchberg. Candidates must become proficient in a broad range of outdoor skills, earn a minimum of 21 merit badges, serve in a leadership position in the troop, and execute a service project for the benefit of the community. The troop meets every Tuesday night at 7 p.m. at St. James’ Church, 3903 Wilshire Blvd. Age range is 11 to 18. For more information, visit bsalatroop10.mytroop.us/home.